How has the Islamic community reacted to President Obama’s landmark Cairo speech? 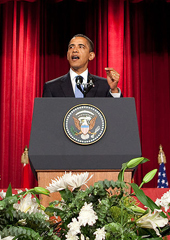 U.S. President Barack Obama gives his speech at Cairo University. New media workers at Islam Online understood that respecting diversity implied advancing equal respect for all religious interpretations. Both admirers and critics acknowledge that President Obama's speech was pathbreaking in substance as well as in style. Some Egyptian scholars felt that his speech had empowered moderates who wish to see reconciliation between the United States and the broader Muslim world. To our dismay, we found a lot of despair and anger among Egyptian intellectuals at the failure of the Middle East peace process. This new perfume sir, its name Obama," said the old Cairo perfumer. His marketing gimmick was no surprise. Egypt is suffering from a strong case of Obamania. Intellectuals and ordinary people alike need little encouragement to talk about President Obama's June 2009 speech. While some are cynical and skeptical, optimism and hope is generally the order of the day. Since President Obama's speech, various intellectual forums in Cairo have held seminars to discuss the content and the intent of his speech, which both admirers and critics acknowledge was path breaking in substance as well as in style. I witnessed this cultural phenomenon when I led a delegation of U.S. scholars and leaders to Egypt for an exercise in public diplomacy. We talked with local scholars, activists and community leaders of different intellectual and political currents on issues of democracy, faith and community, as well as discussing U.S.-Muslim relations. Visits like this illustrate how the United States is actively seeking to improve understanding and cooperation with the Muslim world. At the Egyptian Council on Foreign Relations, several leading Egyptian analysts acknowledged that there was indeed a "new language" in President Obama's discourse towards the Middle East, but they remained skeptical about prospects for significant change in U.S. policy. They reiterated the commitment of Egypt's elite to Islam as the main source of Egyptian values, but also argued that secularism was the preferred choice of Egyptian people. Like most other Islamic opinion makers, they tried to emphasize the centrality of the Palestinian issue. They argued that, unless it was addressed honestly and fairly by the United States, the U.S. image in the Muslim world would not improve. At the Al-Ahram Center for Political and Strategic Studies, we found that President Obama's speech had launched an interesting debate in the Egyptian public sphere. Scholars there felt that his speech had empowered moderates who wish to see reconciliation between the United States and the broader Muslim world. President Obama's language and demeanor was more in line with the image of the United States advanced by Egyptian liberals. At the same time, it undermined the credibility of nationalist and Islamist critiques of emerging U.S. policies in the region. Several policy analysts at the Al-Ahram Center also made an interesting suggestion. They argued that the United States had a better chance of leveraging Hamas through Syria than through Egypt. The failure of Egypt to reconcile the Palestinian factions after two years of negotiations does signify that a new approach is needed. They suggested that Syria — and not Egypt — had a better chance of mediating between Palestinian factions because it had greater influence with Hamas. If the United States can come to an understanding with Syria, they argued, then there was a better chance of a united Palestinian negotiating partner emerging. To our dismay, we found that there was a lot of despair and anger among Egyptian intellectuals at the failure of the peace process. Several intellectuals of different persuasions — pro-regime, regime critics and Islamist sympathizers — felt that the two-state solution had already expired. Unless settlements were curtailed and dismantled, they felt that there was no hope and no land left for a Palestinian state. But on the positive side, commitment to peace with Israel remained strong. Egypt's refusal to open the southern borders of Gaza during the Gaza war in January 2009 was cited by one scholar as proof of Egypt's commitment to the peace treaty. Though we did not meet with any Islamist groups, a visit to Cairo University produced encounters with people sympathetic to the Islamist cause. Some of these meetings were awkward — which underscored the suspicion and skepticism with which Islamists and Americans approach and confront each other. At the Dialogue of Civilizations, faculty insisted that President Obama's speech in Cairo reflected his lack of understanding of Islam. This came as news to us, and perhaps to the rest of Cairo as well. They maintained that there was one right way of thinking about Islam, and that a Muslim state was well within its rights to enforce this right Islam. When I asked what, then, was the difference between the authoritarianism of Arab secularists and Islamists, I was duly informed that I did not understand Islam and Arab culture. Yet, perhaps one of the most dynamic places in Egypt is Islam Online, a major web portal that disseminates information on Shariah, culture, politics and fashion. Islam Online is run by very young, motivated and hard-working people. During our meeting with their editors, we asked them why they thought it was appropriate for Muslims living in Egypt to tell Muslims living in the West what was the best way to practice Islam. They informed us that since their point of view was both diverse and moderate, it appealed to Western Muslims. These new media workers understood that respecting diversity implied advancing equal respect for all religious interpretations. Their image of mainstream Islam was both diverse and balanced. When President Obama had addressed the Turkish parliament, Islam Online commissioned an article to assess the contents of Obama's message. At that time, I was impressed that they had come to an American Muslim known for his support for President Obama, and had not approached some well-known critic. In our meetings, we found more evidence of their willingness to give Obama as much opportunity as possible to reach Muslim audiences without prejudice. 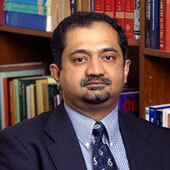 Muqtedar Khan is a professor of political science and international relations at the University of Delaware.